In the winter of 1850 a wild North Sea storm uncovered Neolithic ruins at Skaill Bay on the Orkney Islands of Scotland. Further excavations and study determined that a small village of 10 homes had been established there circa 3500 BC. All the homes were the same in size and structure. This little egalitarian community of around 50 people had come together before the Great Pyramids of Egypt were built. The dig yielded many artifacts including pottery, tools, jewelry, and even gaming dice which are preserved in the museum in Kirkwall. The houses had a central hearth, bed boxes and cupboards all made from stone. As trees struggle to survive on the storm blown islands it is speculated that the inhabitants may have used drift wood from the beaches for their fires. No war-like weapons were discovered and the people were most likely peaceful farmers who also fished for sustenance. Sometime around 2500 BC the village was abandoned. The Orkneys are home to the famous Ring of Brodgar and Stones of Stenness which also date back to before the pyramids. These are part of the Henge Monuments, but who built them and why is still surrounded in some mystery. A bit further from the famous stones is the Maeshowe Tomb. This site is very similar to those found in Ireland and are from the same period. Also check out this post on St. Magnus Cathedral and John Rae on the Orkneys. thank you for reading Betunada!! I will have to look up that Russian settlement!! 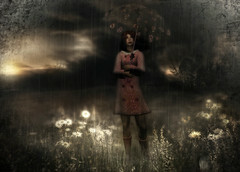 Amazing post processing Cybele! I love the magic you always add. I appreciate so much your lovely comments Maria! so pleased you enjoyed the post!! Thank you Thom! Thanks so much Ali! I hope you do. Its really fascinating- people through the ages- there is a lot of graffiti on the walls of ancient Pompeii too,- much of it political insults and a lot of it very raunchy public washroom stuff!! Ah… that’s another place I have always longed to go! You have magically rewound time,you stunningly travelled me so back in time,dear Cybele!Fabulous photos with ages-old Neolithic stone ruins and great references to historic Scotland!The nature-based placement of the doorway in the Maes howe Tomb and the Viking runes are of great cultural value too.Superb your choice for the challenge! thank you so much Doda . Have you seen them!! I love your history pieces about ancient ruins. From the Mayans to the Henge. Thank you for sharing them Cybele. Do enjoy your weekend. Good to hear from you Peter!! Thank you for your encouraging support! Enjoy the weekend too! Such as a great history, your photos are incredible good. Thank you for sharing Cybele! many thanks and appreciation Della for your support! It’s astonishing what comes to light … and one can only wonder what brought about the change …. I love your pictures here … the Ring is very striking Hannah . Glad those clouds behaved for you 😉 Nice work ! so glad you liked this post Poppy! Thank you! Fascinating history! I love the clouds above the stones of Brodgar! They make the site more dramatic and mysterious. yes it seems like they wouldn’t but they were there and probably scared- hence the bravado lol! thanks Deborah! I loved seeing Skara Brae. Your images really bring out the beauty of the spot. Can you imagine discovering such a place under a sand dune! I wish!! we’d be famous!! Thanks so much Pam! put it on your list!! Thanks Adrian! me neither, though I’m sure it was full of stuffs and furs!! Thanks Wendy! Gorgeous photos Cybele! It looks such an amazing place, I must get there some day, you describe it so beautifully. I love the Viking graffiti! me too- it was quite amusing!! and yes you must go some day! Thank you Katie! thank you Ed and for the weekly challenge!! thank you so much Sheldon! My dad’s name was Eric and he got around! haha- a tomb robber eh!!? Dr. Chandra, Will I Dream? "though fire be mixed with my dust yet care I not for now all is well with me" - your smile made everyone want to be your friend. You are much missed. Introverted, Neurotic, Freckled Peculiar (INFP personality) traveler,and photographer, I'm the hopeful storyteller, sometimes a virtual wanderer, a seeker of light and magic - and a finder of old bones and philosopher stones- including adventures in the time machine. Just your average everyday mad woman.